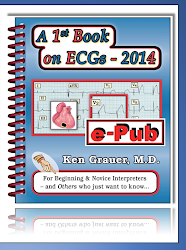 BE AWARE: This is a highly advanced ECG post that supplements my ECG Video-7. 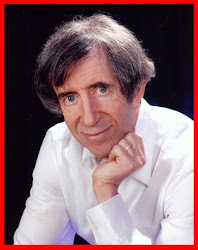 The essential concepts to master were presented in the Video. But for those of you who want more — this post hopefully takes assessment of this fascinating case to a new level! Your feedback and comments are welcome! What is the rhythm in the long lead II shown in Figure-1? Is this VT? If you think it is — How certain are you of your diagnosis? 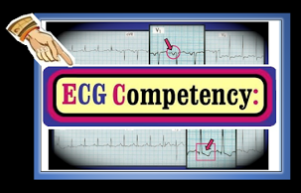 Our animated Answer to these questions was covered in detail in our ECG Video-7. 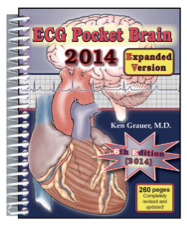 Our purpose in this follow-up ECG Blog #102 — is to address the point highlighted by one of our followers (Алексей Рукин) — regarding the value of meticulous comparison of the WCT tracing in Figure-1 with the post-conversion ECG. 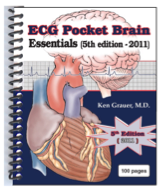 Acknowledgment: My appreciation to Dr. Sa’ad Lahri (Cape Town, South Africa) — for providing me with the case and tracings for ECG Blogs #101, 102. Figure-1: Initial 12-lead ECG and long lead II rhythm strip obtained from a 70-year old woman with chest pain. Is this VT? How certain are you of your rhythm diagnosis? 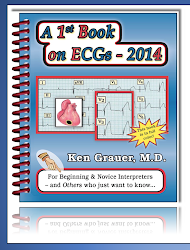 (Figure reproduced from ECG Video-7). NOTE — Enlarge by clicking on Figures — Right-Click to open in a separate window. Although the 70-year old woman in this case was hemodynamically stable at the time the tracing in Figure-1 was obtained — she was having chest pain. 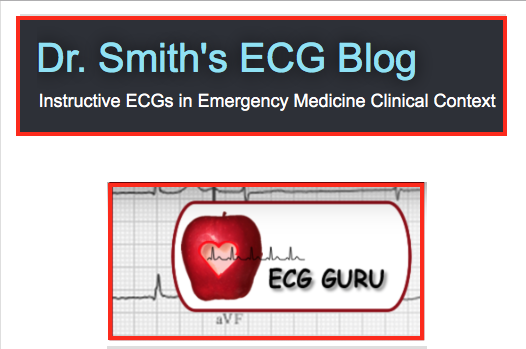 Therefore — a quick decision needed to be made as to whether immediate cardioversion was indicated. Definitive rhythm diagnosis need not be made initially. Instead — the emergency providers in this case rapidly recognized from the long lead II rhythm strip that the predominant rhythm was a regular WCT without normal sinus P waves. Statistical odds that this rhythm was VT (Ventricular Tachycardia) — were at least 90%. In a 70-year old woman with new chest pain — the appropriate decision was immediate cardioversion. This resulted in conversion to sinus rhythm (as we will see momentarily in the post-conversion tracing in Figure-3). One of the major points emphasized in ECG Video-7 — was the presence of a number of additional clues in Figure-1 that increase the likelihood that the rhythm is VT to virtually 100%. Feel free to take one more look at Figure-1 to see how many of these clues you can identify. Our answers follow below — which we illustrate in our labeled Figure-2. Figure-2 We have labeled Figure-1 to illustrate additional clues that make diagnosis of VT a virtual certainty. 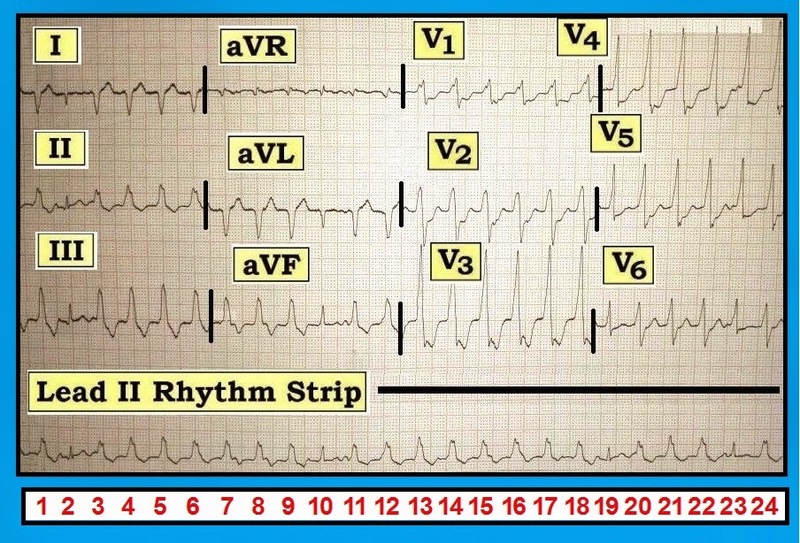 As emphasized in ECG Video-7 — atrial activity is present (at least some of the time) in the long lead II rhythm strip. RED arrows highlight sinus P waves that we see. While the rapid rate, QRS widening and ST-T wave abnormalities prevent us from marching out P waves throughout this entire long lead II rhythm strip — regularity of the P waves we do see (red arrows) — suggests that there is an underlying sinus rhythm at a rate of ~130/minute. Among the most helpful clues for confirming that a wide tachycardia is VT — is the presence of one or more of 3 related ECG signs. These are: i) AV dissociation; ii) Capture beats; and iii) Fusion beats. All 3 of these ECG signs are present in Figure-2 — which proves this rhythm is VT.
AV Dissociation is present in Figure-2 — because there is an underlying sinus rhythm (suggested by the red arrows) that is unrelated to the wide tachycardia (ie, the P waves = [red arrows] that precede beat #3 and follow beats #7,8,15 are not being conducted). The QRS complex is narrow for beats #2, 10, 19 and 23. Each of these beats is preceded by a sinus P wave. Therefore — beats #2,10,19,23 are all Capture Beats (in which a sinus P wave occurs at just the right point in the cycle to get through the AV Node and “capture” the ventricles). Beat #11 is a Fusion Beat. 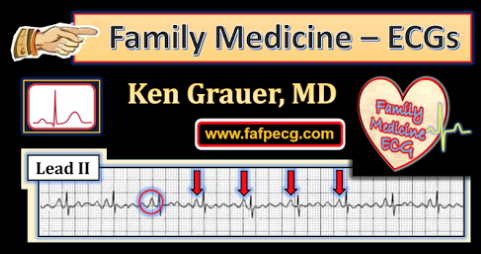 We recognize this because both QRS and T wave morphology of beat #11 is intermediate between sinus-conducted beats (like beat #10) and ventricular beats (like beat #12). That beat #11 is a fusion beat is perhaps best seen within the BLUE rectangle in lead aVF. (IF beat #10 and beat #12 “had children” — the offspring might be expected to look like beat #11, which represents “fusion” between the morphology of beats #10 and #12). 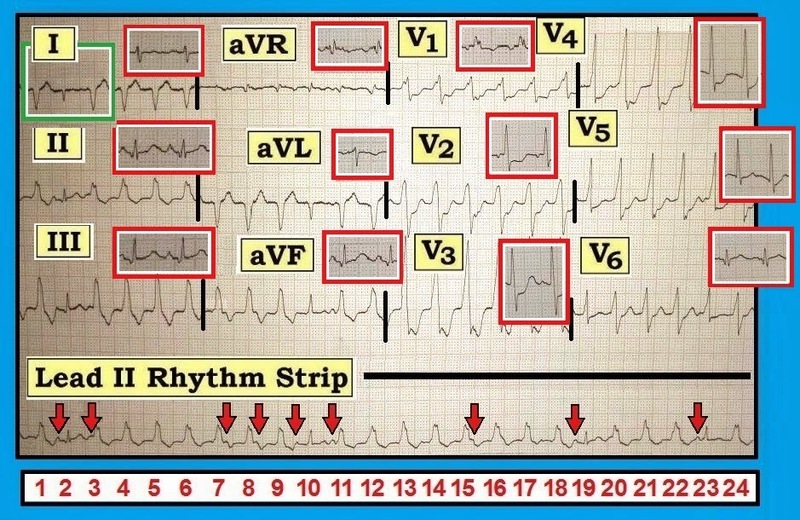 KEY POINT: — Assessment of QRS Morphology and determination of Axis during tachycardia are 2 additional features that confirm (with virtual certainty) that the rhythm is VT. To facilitate assessment of QRS morphology in each of the 12-leads on this tracing — We have placed a “V” above those beats that are ventricular in each lead. Note how simultaneous recording of a long lead II rhythm strip below the 12-lead ECG facilitates determination of which beats are sinus conducted (ie, capture beats) — and which beats are ventricular ( = the several short runs of NSVT = NonSustained VT). The presence of extreme Axis Deviation (ie, the finding of an all negative QRS in either lead I or lead aVF) is rare with supraventricular rhythms. Thus, the all negative QRS complex within the GREEN rectangle in lead I of Figure-2 by itself virtually proves the rhythm is VT. Regarding QRS Morphology: The 3 KEY leads for assessing the presence and type of BBB (Bundle Branch Block) are leads I, V1 and V6. 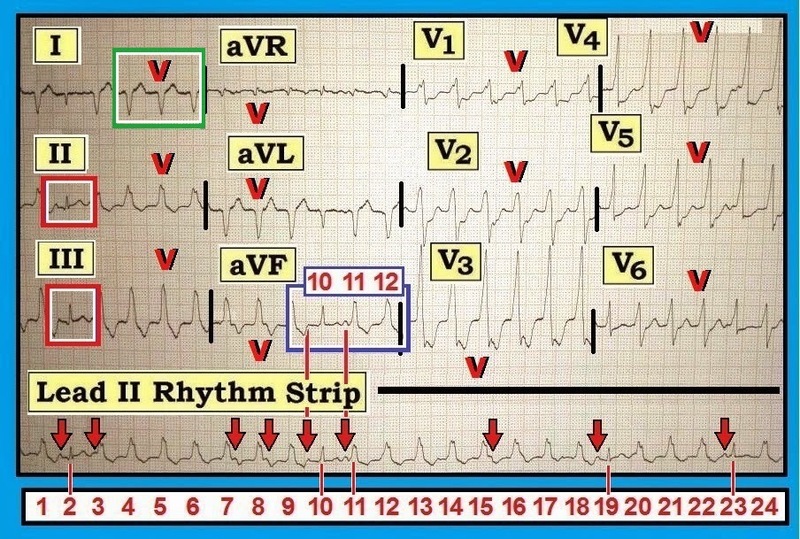 Aberrancy almost always manifests QRS morphology consistent with some form of conduction defect (ie, RBBB with or without a hemiblock; or LBBB). Therefore — the presence of QRS morphology that is inconsistent with some type of conduction defect makes aberrant conduction or preexisting BBB less likely (although it does not completely rule it out). In Figure-2 — the wide terminal S wave in lead V6 is consistent with RBBB. However, the amorphous and widened R wave in lead V1 that ends with an S wave rather than an R’ is not at all suggestive of RBBB — and, the all negative QRS in lead I is unlike any form of BBB. Thus, QRS morphology strongly suggests the rhythm is VT.
A Reason for VT? A final clue that this rhythm is VT is contained within the RED rectangles shown in leads II and III of Figure-2. Note the subtle-but-real small q waves and suggestion of hyperacute ST elevation (especially in lead II) in this 70-year old woman who presented with new-onset chest pain. As was later confirmed on cardiac catheterization — this patient had acute occlusion of a dominant LCx (left circumflex) artery — so, her acute inferior STEMI (ST Elevation Myocardial Infarction) clearly provides a “reason” for her episodes of NSVT. Even though the QRS complexes seen in leads V1,V2 of Figure-2 are ventricular — the shape of the ST depression seen in these leads suggests acute posterior involvement consistent with these cath findings. Assessment of the Post-Conversion Tracing: What Can Be Learned? As mentioned earlier — this patient was promptly cardioverted — which resulted in conversion to sinus rhythm, as shown in the post-conversion ECG (in Figure-3). What can be learned from the post-conversion tracing? There is RAD (Right Axis Deviation) — with an rS predominantly negative QRS complex in lead I. This may reflect LPHB (Left Posterior HemiBlock) — especially if it is a new finding in this 70-year old woman who is found to have acute LCx occlusion. There is IRBBB ( = incomplete RBBB) — given the predominant R wave in lead V1 plus narrow terminal s waves in leads I,V6 — but no QRS widening. The ST elevation that we saw in leads II,III in Figure-2 seems to have resolved. Small inferior q waves persist. Localized ST depression (in leads V2,V3,V4) persists, with disproportionately tall anterior R waves. This is consistent with acute posterior involvement. Small q waves of uncertain significance are seen in leads V5,V6 (septal q waves — vs infarction q waves from acute LCx occlusion?). There appears to be slight-but-real ST elevation in lead V6 (especially when compared to if anything, slight ST depression in lead V5). Thus synthesis of ECG findings from capture beats in Figure-2 plus analysis of the post-conversion tracing in Figure-3 are consistent with acute infero-postero-lateral STEMI (confirmed by cath findings of acute dominant LCx occlusion) — that resulted in runs of NSVT. Figure-4: Comparison of post-conversion QRS morphology (within red rectangles) to the 12-lead ECG during the wide tachycardia. Given successful treatment of this patient — We enjoy the luxury of being able to dissect her initial ECG ( = Figure-1) by direct comparison with the post-conversion tracing (Figure-3). We do this in Figure-4 — in which QRS morphology after conversion to sinus rhythm is shown within RED rectangles in each of the 12 leads. Making this lead-by-lead comparison suggests a fascinating finding — namely that all narrow complexes on this tracing probably represent some slight degree of fusion rather than being pure “capture” beats. Therefore — rather than representing a series of short runs of NSVT — we strongly suspect continuous VT throughout the entire long lead II rhythm strip seen in Figure-1! Note the middle complex within the GREEN rectangle in lead I of Figure-4. This middle complex is narrow and all negative. It’s shape is precisely what one would expect to see if the post-conversion sinus rS complex in lead I (within the RED rectangle) occurred at the same time as the all negative QS VT beat did. It makes much more sense that the all negative narrow QRS within the GREEN rectangle in lead I is a fusion beat — because it is so rare for sinus beats to manifest an all negative QRS in lead I. In contrast — the predominantly negative rS complex in lead I of the post-conversion tracing is perfectly consistent with a LPHB pattern, which is not at all unexpected given acute occlusion of a dominant LCx artery. Similarly — there are other subtle differences in morphology during and after VT in other leads that suggest all narrow beats in Figure-1 probably represent fusion complexes (ie, loss of the small initial r wave in lead aVL during VT for beat #10 — and loss of the initial small q wave in lead V6 during VT for beat #23). 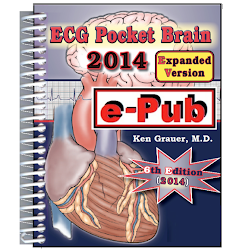 CLICK HERE — for download of a pdf review on assessment of the regular wide tachycardia (excerpted from my ACLS-2013-ePub). Detailed discussion of QRS morphology, axis during tachycardia, and other discriminating criteria is included.